BEIJING | The shortage of elder care in China’s major cities has created a list of more than 10,000 applicants waiting for the 1,100 beds available in the capital’s No. 1 Social Welfare Home, according to the Beijing Evening News. A staff member at the home told the newspaper that anyone applying now would have to wait a lifetime to get in. Numbers are so tight, he said, that only a dozen places were coming up each year. The public care home is located in the central district of Chaoyang, offers good care, and charges between $110 and $558 a month for a bed, making it extremely popular. 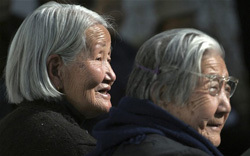 Elderly Chinese have traditionally lived with, and been looked after by, their children. However, China is aging rapidly. By 2015 there will be 220 million over-60s and within 40 years the number will rise to 500 million, one-third of a population that is expected to be just shy of 1.5 billion. Encouraged by Chairman Mao, there was a baby boom in the early decades of Communist rule, followed in 1979 by the one-child policy and a sudden fall in the number of births. Today, around 450,000 elderly in the Chinese capital live apart from their families, but Beijing only has around 215 public nursing homes and 186 private homes, or roughly three beds for every 100 seniors. The city is rapidly expanding its facilities, and has promised 120,000 beds for old people by 2015, according to the Beijing Municipal Civil Affairs Bureau. But prices in the private sector can be steep: one luxury care home on the outskirts of the city charges 250,000 yuan ($39,804) a year. The government’s policies are likely to continue with the basic concept of ‘nine-seven-three’: 90 per cent of old people will live at home, seven per cent will get government care and three per cent will live in private facilities. [The city of] Shanghai, meanwhile, has also drawn up plans to ramp the number of elderly care homes and to import care-givers from other provinces in China. “We have been open for more than a decade, but we always struggled to fill our 60 beds,” said Gu Yuqing, the sprightly 74-year-old owner of Ai Wan Qing, a care home in Shanghai’s suburbs. “That all changed two years ago. And in the past two months we have been getting constant calls. We are full to bursting,” she added. “Beforehand, young people worried that if they put their parents into a home, the neighbors would criticize them behind their backs. But that has all changed now. And for older people, they sometimes prefer to be independent.” Mrs Gu is now eying a project in Shanghai’s suburbs where her residents will be able to play golf and tennis. BEIJING | China’s top national statistician on Friday (Jan. 18) called for changing the country’s one-child policy because of the nation’s shrinking pool of workers, adding to a chorus of opponents who say the policy will have long-lasting effects on the country’s economic stability. The absolute size of the working population, aged 15 to 59, fell by 3.45 million people to 937 million last year, Ma Jiantang, head of China’s National Bureau of Statistics, said in a news briefing. Mr. Ma’s comments come as many Chinese demographers call for an end to the family-planning policy, which was implemented in 1980 to manage a population explosion encouraged by Chairman Mao Zedong. They argue that [continuing to implement] birth restrictions threatens the country’s labor force, which has been the backbone of its economic growth in recent decades. The policy has also come under criticism for enforcement tactics including forced abortions and sterilizations. Such practices are illegal in China but sometimes enforced by local officials under pressure to meet population targets. …In June…the case of Feng Jianmei, a 23-year-old woman who was forced to undergo a late-term abortion, drew nationwide outrage after photos of her and the aborted [baby] appeared online. Beijing has been sending mixed signals about its plans for the policy. In November, when Communist Party leaders gathered for the 18th Party Congress, leaders flagged in a blueprint document for policy makers that the government would “steadily improve the population policy and promote long-term and balanced population growth.” Most interpreted that to mean that change would be coming, said Wang Feng, a population expert and director of the Brookings-Tsinghua Center for Public Policy in Beijing. 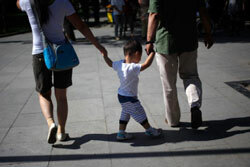 But on Tuesday the head of China’s National Population and Family Planning Commission dismissed speculation that the one-child policy would be scrapped in the near future. Minister Wang Xia said in a commission meeting that maintaining a low birth rate will be a top priority. There are a number of new exceptions to the one-child policy. Minority groups are exempt, and anyone with enough money can get around penalties for having a second child. Rural families whose first child is a girl may have a second child, as can married couples who are both themselves only children. Mr. Wang said there is wide consensus among scholars that there is no justification for the continuation of the one-child policy. “Change is inevitable, but with further delay, greater harm will be done,” Mr. Wang said. 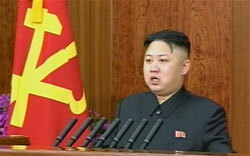 North Korea: dictator Kim Jong-Un delivering his New Year’s address. North Korea purchased 16,420 closed-circuit surveillance cameras from China in the first 11 months of last year as the regime stepped up the monitoring of its own people. That figure is on top of the 85,570 similar cameras that it has bought in the past three years, with the total cost running to more than $9.77 million, according to South Korea’s Chosun Ilbo newspaper. The new regime of Kim Jong-un has carried out a crackdown on people hoping to escape their repressive homeland, as well as anyone using a mobile phone to communicate across the border and smugglers bringing in banned newspapers, books and recordings of television programs that show the lives of people in prosperous South Korea. “All surveillance equipment there has something to do with the regime’s attempt to tighten its control over society,” a South Korea government official told the paper. Evidence that North Korea is tightening its control on the lives of the people coincides with a new report by the United Nations high commissioner for human rights that concludes with a request that an international investigation be carried out into Pyongyang’s “deplorable” record on its citizens’ rights. In a statement issued in Geneva, Navanethem Pillay said, “There were some initial hopes that the advent of a new leader might bring about some positive change in the human rights situation. b) List the factors contributing to the severe shortage of senior care centers in China. c) In the past, elderly Americans lived with and were looked after by their adult children. Do you think the new system of putting aged parents in a nursing home benefits the parents, their children and grandchildren? Explain your answer. How would having a grandparent live in your home be a benefit to you? d) Do you or anyone you know have a grandparent living with them? Ask a grandparent where their grandparents lived when they became too old to live alone. b) China’s One-Child policy has caused many unintended negative consequences. In addition to creating a gender imbalance (if allowed only one child, most families think it is more important to have a boy and therefore aborted girl babies), it is now creating a reduction in the labor force which will negatively affect the economy. Read more about China’s One-Child policy under “Resources” below “Background.” Why do you think the head of China’s National Population and Family Planning Commission said in a commission meeting that maintaining a low birth rate will be a top priority? b) How many other surveillance cameras had the government already purchased in the past 3 years? c) With a population of 25 million, the North Korean government’s surveillance program has one camera for every 250 citizens. The people most likely can’t make a move that isn’t monitored. In the U.S., a growing number of city governments have installed more and more surveillance cameras on street lights, corners and government buildings to catch criminals or to catch drivers violating speed restrictions, red lights or other laws. The one-child policy …is the population control policy of the People’s Republic of China (PRC). … It officially restricts the number of children married urban couples can have to one, although it allows exemptions for several cases, including rural couples, ethnic minorities, and parents without any siblings themselves…. The Chinese government introduced the policy in 1979 to alleviate social, economic, and environmental problems in China, and authorities claim that the policy has prevented more than 250 million births from its implementation to 2000. The policy is controversial both within and outside China because of the manner in which the policy has been implemented, and because of concerns about negative economic and social consequences. The policy has been implicated in an increase in forced abortions and female infanticide, and has [caused a] gender imbalance in China….